Drum Corps International is pleased to announce preliminary attendance figures for the 2011 DCI World Championships, held Aug. 11-13 at Lucas Oil Stadium in Indianapolis. The attendance for the three-day event totals 36,617, which does not include corps and staff members who entered the stadium after performances with wristbands or staff/VIP credentials. "Finals-night attendance this year grew 9.2 percent from last season," said Dan Acheson, Executive Director of Drum Corps International. "Given the difficult economic climate being experienced by many drum corps families and fans, we are pleased with the growth of our largest event. We look forward to continuing to develop opportunities to engage more people in the drum corps experience across the entire Drum Corps International Tour in line with our strategic plan." 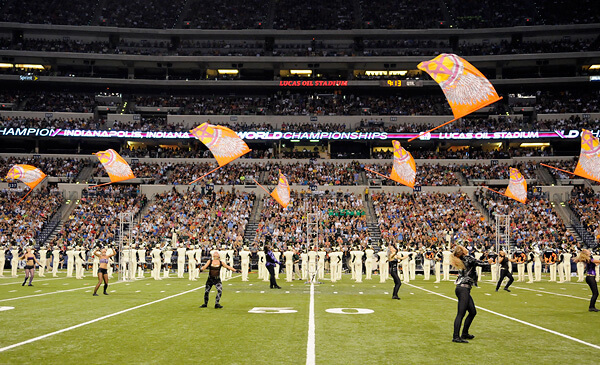 Carolina Crown performs at Lucas Oil Stadium at the World Championship Finals. The Open Class World Championship in Michigan City, Ind., welcomed 1,191 spectators to Ames Field during the two-day event, representing a 30 percent increase in attendance from a year earlier. The 2012 Drum Corps International World Championships will take place Aug. 6-11, once again in Michigan City and Indianapolis.